Even robot systems occasionally need a negative supply voltage for some purpose or other, and in this kind of application in particular there is a need for an effective circuit that does not make greater demands then necessary in terms of current or space. 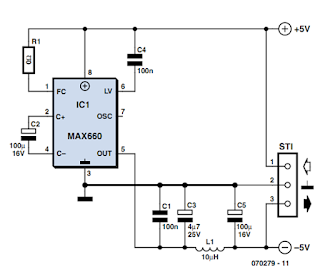 If a low current 5 V supply is needed and only +5 V is available, a natural manufacturer to turn to is Maxim, and indeed in this case they do not let us down.The best known integrated circuit made by this company is the MAX232, a level shifter for serial ports with an integrated charge pump that does not need an external inductor. Along the same lines, although with a more stable output voltage and higher efficiency, is the MAX660. 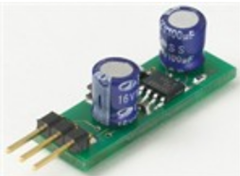 The device can ‘mirror’ any input voltage between 1.5 V and 5.5 V. With a 5 V input the output is typically –4.7 V with a load of 100 mA. Efficiency at 10 mA is around 96 % and at 100 mA is around 88 %. 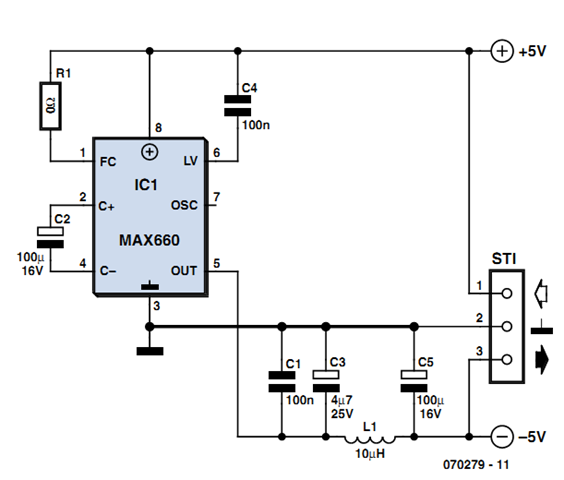 With an open-circuit output the IC draws a quiescent current of just 120 μA.There is little to say about the circuit itself.